If you are not into theatre, tired of just going out to eat or getting a drink at a pub, here are some fun outings that just take a bit of pre-planning and booking. Set within 3,000 acres in Surrey, Bisley Shooting Ground is Europe’s largest sporting clay ground and one of the top shooting schools. 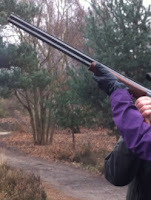 Though I am not a fan of guns and the closest I have come to holding one was at amusement park shooting galleries, I decided while in England to give the sport a shot, literal. Being a complete novice, it was a bit intimidating to walk up to the Clubhouse and see women dressed in shooting vests and carrying their own shotgun holsters. We were put in a group with three lovely English women and accompanied by an instructor who competes professionally. Once I got over the initial intimation, my paranoia turned to the question of whether I was going to hit anything. Thanks to expert instruction, this too was unfounded and I managed to hit two clays released in succession. We finished the day with a delicious homemade lunch. Even though it was Ladies Day, full portions of food were on offer*. I can vouch that it’s worth skipping morning breakfast and mid-morning tea break to make it to the Victorian Sponge Cake. 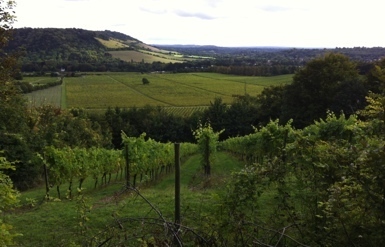 England's largest vineyard located just outside in the Surrey Hills offers 'public' events and themed evenings. Participating in a murder mystery dinner has been on my bucket list for some time and Denbies cleverly orchestrated Murder at Lovelace Manor was a perfect introduction. After witnessing the ‘murder’, we were divided into teams of eight and given a suitcase of clues. The four suspects presented their stories before each course and we were free to interview them through the course of the evening. Each team came to a consensus on the murderer and motive and wrote up a summary. A winning team was selected and presented with a bottle of bubbly. It was a fun night to spend with friends and new acquaintances. Denbies also offers grape-picking experience day, which will give you an up-close appreciation for every glass you drink. I’ve been completely intrigued by the idea of seeing and tasting a film at the same time. 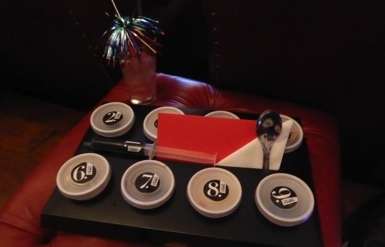 When you get to your cinema seat, there is a tray of small numbered boxes that holds canapé-sized food or mini cocktails. These items are to be opened at specific times during the film. The menu is based on an interpretation of what is happening on the screen. In Grosse Point Blank, you get a taste of poison via syringe, experience the exploding building in your mouth and have a bit of breakfast with the characters on screen. The team behind the creative menu includes experimental chefs, food designers and mixologists. We sat towards the back and were treated to refills of Class of ’86 Bombay Sapphire cocktails.